With the holiday season rolling around the corner, what better way to show your holiday spirit than to create these adorably easy and budget-friendly Caramel Pumpkin Rice Crispy Treats. They’re great to pass out at parties as a parting gift or to stick into goodie bags. They also can also double as the centerpiece of your dessert table during get-togethers. The Caramel Pumpkin Rice Crispy Treats take less than 40 minutes to make, but look like you spent hours on them. The most critical step: spray your molds. Each time you use your mold, make sure it’s greased with something (non-stick spray, melted butter, etc). Working with melted marshmallows can become a gooey mess, but it’s avoidable if you take precautions. The next step is to melt the 3 tbsp of butter over medium-low heat and to combine it with the JET-PUFFED Pumpkin Spice Mallow. Be sure to stir the mallows often until it becomes gooey. That’s a technical term in my kitchen. Next, add the crispy rice cereal and stir to coat. Make sure it’s thoroughly combined. You’re counting on that stickiness to help your treats keep the mold shape. Remove the pot from the heat once it’s combined. Press the crispy treat mixture into the greased Holiday Jigglers Molds. Be sure to press it tightly and keep it in the mold for 3-5 minutes until it cools and keeps its shape. Poke a hole in the pumpkin spice crispy treat with a lollipop stick and set aside. Continue this process until all the treats are pressed. With that part completed, it’s time to melt the Kraft Caramel Bits and to add a couple teaspoons into each mold. Once again, press the cooled treats into the mold (after having removed the stick). Let the caramel cool 2-5 minutes in the mold before removing from the mold. It will come out of the mold, trust me. Just be sure you greased it first. And…voila, impressive yet incredibly simple Caramel Pumpkin Rice Crispy Treats. After I make these, I like to cover them to keep them safe and fresh. 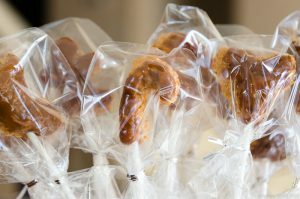 A simple treat bag with a twist tie does the trick and makes it easy for guests to take them with them as they leave your party. I can imagine handing these out as Halloween treats using different Jiggers molds. How do you plan on using them? Leave a comment below if you have another impressive use for these. I’d love to hear it! Caramel coated pumpkin spice crispy treats are an easy and impressive dessert for your next holiday get-together or party. Spray the JELL-O Holiday Jigglers Mold Kit with non-stick cooking spray or brush with melted butter (to prevent sticking). In a large pot, melt the 3 tbsp of butter over medium heat being careful not to burn. Once the butter is melted add to the pot the entire bag of JET-PUFFED Pumpkin Spice Mallows. Stir every 10 seconds until the marshmallows are completely melted and the mixture becomes gooey. Remove from heat. Using a buttered or grease spoon, combine the crispy rice cereal and the pumpkin spice marshmallow mixture. Carefully fold over the mixture until all the cereal is coated. Press the marshmallow and crispy cereal mixture into the Holiday Jigglers Mold Kit. Be sure to press the crispy treat down into the mold as much as possible adding more if necessary. Allow the treat to cool 3-5 minutes in the mold to ensure it keeps its shape. Remove the treats from the molds and carefully place a lolly pop stick up through the bottom roughly 1.5″ (3-4cm). Continue steps 5 and 6 until all the treats are pressed. Set aside. In a small saucepan, add the bag of Kraft Caramel Bits and 1 tbsp of water. Melt over medium to low heat, stirring constantly, until thoroughly melted. Once again using the Jigglers mold, spray with non-stick spray and add roughly 2 tsp of the melted Caramel Bits into the bottom of the mold. Do not fill the mold entirely with caramel. 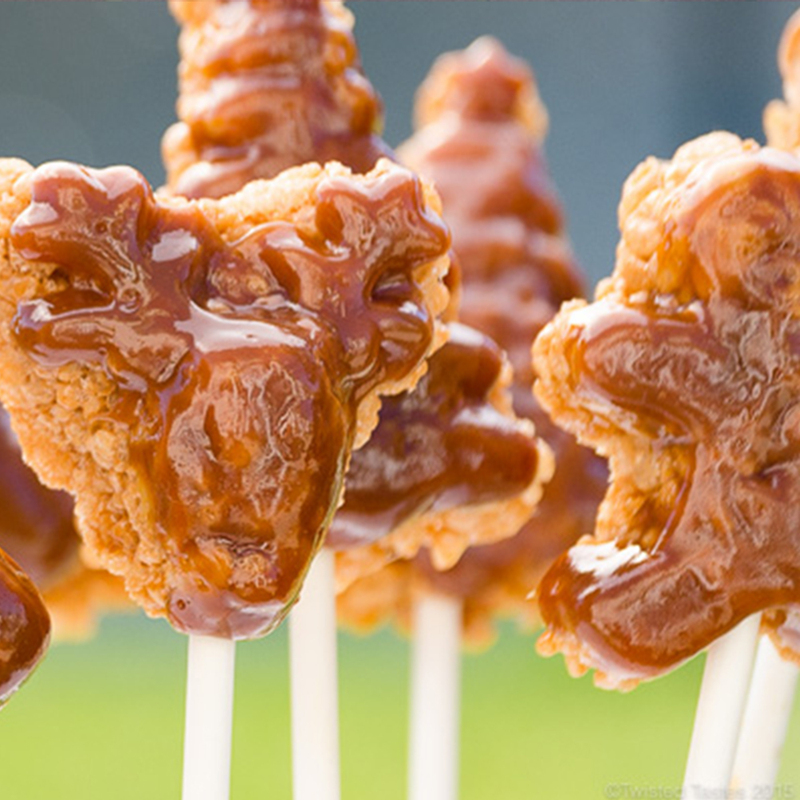 Remove the sticks from the cooled crispy treats and press them back into the mold on top of the melted Caramel Bits. Allow the caramel to cool another 3 minutes before removing from the mold. 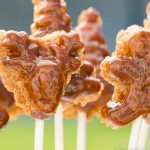 Dip the lollipop stick into the melted Caramel Bits and place the stick back into the hole previously created in the crispy treat (the caramel acts as the glue keeping the stick in place).